I have been working on perfect my technique with BBA's basic white bread sandwich loaf recipe, variation 3. I have had some excellent results, but I have constantly had an issue where after shaping and proofing in the bread pans, the dough doesn't seem to properly stick to itself internally all the time and I get some slices that are flimsy or even fall apart along the line where the loaf was shaped. This hasn't happened to EVERY loaf, but the vast majority that I have made, I'd say 6 of 8 that I have made. The shaping instuction from BBA is to form a boule, rest 20 mins, flatten into a square, fold the sides in so that you have long rectangle, and then roll it up, sealing after each turn of the dough. This method works very well for getting the loaf into the right shape for the bread pan and when they bake up they look great, taste great, have great texture... just this weird issue. I included some pictures to help see what I am talking about. 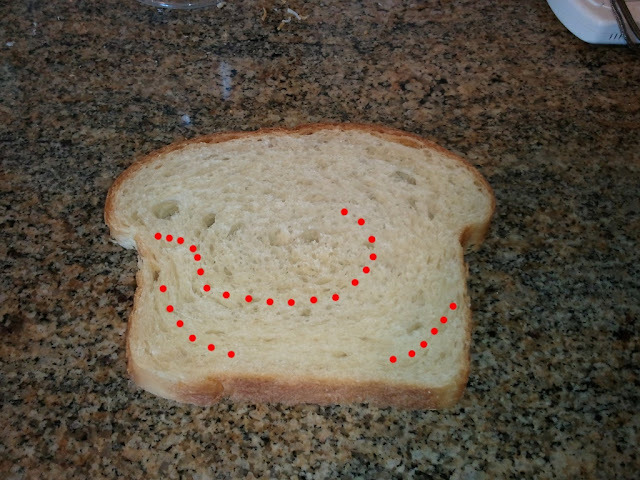 The first I put red dots to follow the very obvious swirl pattern in the crumb of the bread (this loaf was over-proofed a little too, but this happens on loaves that were proofed appropriately too), and the second I lifted the split to show that it isn't even just the line, it isn't even attached to itself. I could understand this happening if, maybe, I used some fflour while shaping and the surface of the dough dried out too much, but I'm not. As per BBA's instructions, all my rests, rises, and fermentations are done with a light misting of spray oil and covered with saran wrap. (I used some flour while shaping and the surface of the dough dried out to much) this could be the problem, if on the surface of the dough before rolling, try to keep that rolled surface moist/tacky enough so it rolls up and adhers together. Sometimes a crack in the rolled seams of cinnmon loaves are made because of the way the cinnamon mixture is applied and the loaf was not rolled up good and tight with proper surface tension. You have had good luck with some the same type of loaves, you might try making a good mental or written note of your shaping steps, proofing times. Every step is important and practice consistancy. I could understand this happening if, maybe, I used some flour while shaping and the surface of the dough dried out too much, but I'm not. Before rolling up the loaf spray what will be the interior with a little bit of water. Avoid too much flour on the work surface. A large cutting board or silpat is a good surface to shape on. Good that you suggest this, I was thinking I might try a light misting next time. I think that the oil you are spraying is acting as a release agent that prevents the dough from bonding to itself across the layers that are formed by rolling up the loaf. As Jim suggested, a little water (instead of the oil) should be a big help. But getting the oil out may be enough even without the water (assuming that there is no visible flour sticking to either surface). just noticed the spray of oil...yes, I agree, that could be the problem. Yes, ditch the spray oil and get a flexible plastic bowl scraper. No need for oil to keep the dough from sticking if you have the proper tool to get it out of the bowl (or off the counter) in one piece. All per the instructions in BBA: I am lightly oiling my bowl when doing the initial rise, I pour a little olive oil in and wipe it around with a paper towel, and then I mist the tops of the boules when they are resting on the counter with saran wrap over, which I assume it to prevent the saran wrap from sticking to the dough. Would I be better off covering the rising dough with a couche or cheese cloth? Even if I put a little flour on the top of the dough to prevent it from sticking to the cloth, that would be easier to remedy by a light water misting before/during shaping. I use spray oil all the time and don't have your problem. My diagnosis: your dough is too dry. You said you didn't use any flour on the counter top....hard to imagine if the dough is adequately hydrated. I have polished cement countertops, and I don't normally flour my counters. Are you saying that my dough is too dry? I though my counters were just very slick. Thanks for the feedback. Are you having a problem? If the dry countertop works for you, don't change a thing. If it ain't broke, no worries. "I have polished cement countertops, and I don't normally flour my counters. Are you saying that my dough is too dry? I though my counters were just very slick. Thanks for the feedback." Many of my early doughs were too dry and they didn't rise well; plus, it produced the seam problem the OP mentioned. I probably err now on the side of stickiness. So are you saying too dry in the sense that my hydration % is off, or just that I'm missing a tbsp water during mixing? If the former, then the recipe would be at fault, which I would highly doubt considering the source. If the latter, then how do I tell what is too dry? I get a good window pane, the dough is tacky to the touch, and tipping it out of the stand mixer bowl requires use of my silicon spatula. I'm also not having rising problems, would that be requisite to diagnose dry dough? I've also only had this issue intermittently. With the same batch of dough (the recipe makes 2 loaves) one loaf would have this issue and the other wouldn't, which is very much the case of the most recent attempt. Not trying to write off your input or anything tgrayson, just trying to wrap my had around the facts get to the root of the problem so I have something to try in a couple of days when I make more. The BBA is a great book and I use it too. He gives a wide range of water to add to the dough; even the lowest quantity of water should make the dough adequately hydrated, assuming that you're measuring by weight. If you're measuring by volume, your hydration could be way off. That said, on a given day with a particular humidity and a particularly dry flour, the needed water can vary a bit. Oh, and be aware that dough that contains butter and eggs can be tacky even when the dough is pretty dry. BTDT. However, your point about making two loves and one experiences the problem and the other didn't tends to undermine my hypothesis. Unless you're letting the boules sit on the counter long enough for the surface to dry out? BTW, I recently made the BBA Challah, which is a relatively dry dough, since it's hard to braid sticky dough. I also sprayed the counter with spray oil while forming the strands. 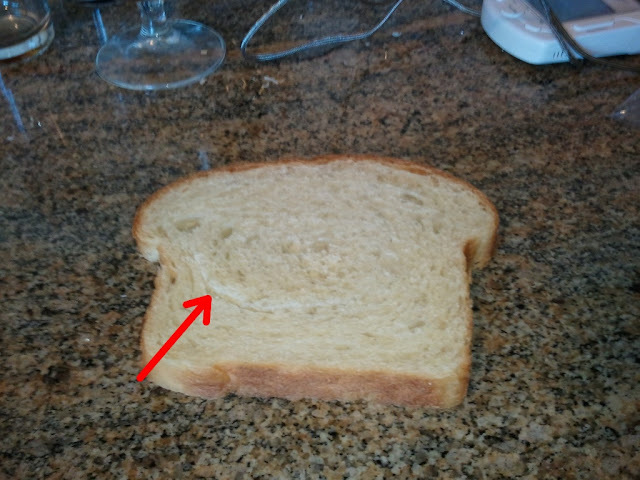 Once I had sliced the bread, you couldn't see the dividing line between the various strands. The point being that even when slightly dry, coated with oil, the strands still melded together. I'm most definitely measuring everything by weight, and I even keep my scales calibrated, so my measuresments should be about as accurate as the home baker can hope for. After getting a little further into the load I pictured above, I found that the split isn't even consistent all the way through the loaf. The second half of this current loaf seems just fine!! As for resting on the counter, I don't spray under the dough as my scraper is very good at picking the boules up for me. I mist the top with spray oil, setting the boules far enough apart on the count to not touch, and then cover each with their own piece of saran wrap. I also leave the second boule covered while I shape the first to avoid drying out. Only other thing I can thik of is that I am getting down to the bottom of my can of spray oil and maybe am getting too much accelerant coming out with the oil? And just to check, 'spray oil' does refer to a product like PAM right? I'm not missing some finer detail that spray oil is actually oil in a plastic spray bottle, right? Please no Pam. It has other stuff in it. Use olive oil or another veggie oil only. Well, it's an interesting mystery you have. It sounds like you're doing everything by the book, no pun intended. Without any other info to go on, I'd suggest boosting the hydration just a bit to see if that solves the problem. I bake a version of this bread at about a 68% hydration, taking into account the other liquids. to lightly oil a 4 qt bowl (stainless or glass) you need about 1/8 t of oil. any more than that should be considered an addition to the dough since only a few molecular layers is all that is needed to keep the dough from sticking. use of a polypropylene tub (one that has not been scrubbed with steel wool or scotchbright) releives you of using even that much. please excuse my lack of capitalization - something isnt working.